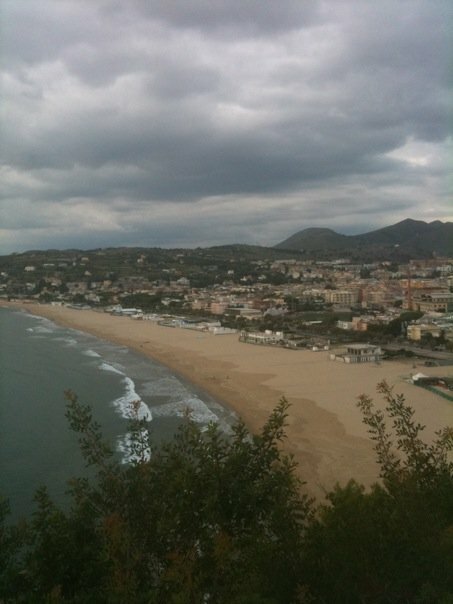 On our honeymoon to Italy, we stopped in Formia an hour south of Naples, which is where my husband's family is from. We met with relatives for a couple of days and they graciously took us through the town. Even with clouds in the sky, it's absolutely gorgeous. For more Saturday Snapshots, click here to visit At Home With Books. Very beautiful! My hubby is from Bali which is Northern Italy. Congrats on the marriage... and wishing you both the best in happiness and love! Oh that is the most beautiful picture! You are right, Natalie. Even though the clouds are a bit dark, it totally doesn't distract from the greatness down below. Thanks for sharing this with us! That is gorgeous! How lucky to have relatives as an excuse to go visit! What a beautiful place! So nice to be able to visit new places and have family or friends who can show you around. How beautiful! I love that I can "visit" places I'll never be able to go through the photos of others. Awesome photo. I backpacked through that area in college, but I would love to go back today with the kids to see it through their eyes. Ah, the ocean! Clouds or not, this is where I want to be right now. Beautiful photo. I hope you had a great time! You took that photo from the perfect vantage point. The village is beautiful. I bet it was an utterly romantic honeymoon. Lovely photo. The clouds cannot detract from the beauty of Italy. I spent a few days in Sorrento and then drove up the coast and it was just gorgeous. We probably passed through Formia on our way to Rome. This is a place I have always wanted to visit. Thanks for sharing this lovely shot! Looks like a place I would like to visit one day! Very beautiful. My husband's family is from Massa Lubrense, which is next to Sorrento (also just south of Naples). We're going there for the first time next March. Can't wait! I've always wanted to visit Italy ... but I must confess most photos usually show the sun shining!! !